When you're as big and rough as Jack Reacher - and you have a badly-set, freshly-busted nose, patched with silver duct tape - it isn't easy to hitch a ride. But Reacher has some unfinished business in Virginia, so he doesn't quit. And at last, he's picked up by three strangers - ... read full description below. When you're as big and rough as Jack Reacher - and you have a badly-set, freshly-busted nose, patched with silver duct tape - it isn't easy to hitch a ride. But Reacher has some unfinished business in Virginia, so he doesn't quit. And at last, he's picked up by three strangers - two men and a woman. But within minutes it becomes clear they're all lying about everything - and then they run into a police roadblock on the highway. There has been an incident, and the cops are looking for the bad guys...Will they get through because the three are innocent? Or because the three are now four? Is Reacher just a decoy? 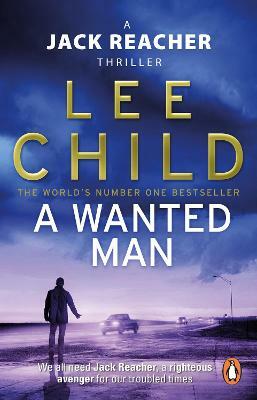 With his signature Swiss-watch plotting and heart-thumping suspense, A Wanted Man shows Lee Child at his sublimely skilful best. He could take out Bond, Dirty Harry, Jason Bourne and Ethan Hunt with both hands tied behind his back. And then sleep with their girlfriends two at a time before getting the last bus out of town . ( Sun ).